Out cross sire lines are very important in breeding. Whether through sons or daughters, out cross lines enhance the fashionable breeding lines and offer variety for future generations. The once mighty and proud French male line of the great sire Tourbillon has had a profound and significant influence to the highest echelon of the turf. Tourbillon was bred by Marcel Boussac way back in 1928 and after a very classy race career when he won the Prix du Jockey Club and the Prix Lupin, two of his six wins from twelve races, he was then to become Boussac’s foundation sire to his prosperous breeding empire. Tourbillon was a good stayer and had good conformation, though was a little behind his hocks. He won races from five and one half furlongs as a two year old to twelve furlongs as a three year old. Tourbillon was sired by Ksar, and was out of Durban by Durbar. Ksar was the leading sire in France 1931 while his sire Bruleur led the French list three times. Tourbillon would do likewise thrice during his stud life. Furthermore, Tourbillon sired two time leading sire Goya (St. James Palace Stakes), champion two year old and four time leading sire Djebel (2000 Guineas, Prix de l’Arc de Triomphe, Grand Prix du Saint-Cloud), as well as champion two year old Ambiorix (Grand Criterium, Prix Lupin), who also became a leading sire. Two other outstanding stakes winners sired by Toubillon were Coaraze and Caracalla. This line descends from Herod and is one of the last surviving male lines of the Byerley Turk. Ambiorix came to Claiborne farm following a seven race career for the princely sum of $250,000. A.B. “Bull” Hancock headed the syndicate and oversaw the stud career of Ambiorix. The good looking dark bay stallion sired four hundred and twenty-three foals of which fifty-one won stakes races. Ambiorix was the leading sire in North America in 1961. Among the top rated runners of his get were High Voltage (Champion two year old Filly), Hitting Away (Dwyer Handicap, Withers Stakes), Ambiopoise (Discovery Handicap, Jersey Derby), Sarcastic (Gazelle Handicap, dam of champion Vitriolic), Pleasure Seeker (Hollywood Gold Cup), Ambehaving (Remsen Stakes), Rash Statement (Spinster Stakes, Alcibiades Stakes, Delaware Oaks), Pinjara (Century Handicap, Del Mar Handicap, San Bernardino Handicap), Count Amber (Narragansett Special, sire of Amberoid) and Amber Morn (Autumn Handicap, sire of back to back Queen’s Plate winners Royal Chocolate and Amber Herod). While racing in Europe, Ambiorix was known as Ambiorix II, as there was an earlier colt also sired by Tourbillon, with the same name. There was no such horse in North America with this name until his arrival, hence the dropping of the “II” designation. Coaraze made twenty-six starts in his highly productive racing career. He won eleven, which included some big prizes such as the Prix du Jockey Club, Prix Morny, Prix d’Ispahan twice, Prix Jacques le Marois and the Grand Prix de Saint-Cloud. Coaraze stood initially at Boussac’s Haras de Fresnay Le-Buffard, but was later sold to Brazilian interests in 1954. Here he became a leading sire and is most famous as the sire of undefeated champion Emerson, who would return the line back to France for a successful stud career. Goya was a half brother to the dam of Coaraze. Following his very good racing career, Goya returned to his birth place, Haras de Fresnay Le-Buffard, and would become a two time leading sire in France before his exportation to the US in 1947. Here he became known as Goya II. Goya sired such excellent runners like Epsom Oaks winner Asmena, champion two year old Nirgal (Prix Morny, Grand Criterium, Great Yorkshire Stakes, Prix Robert Papin, Prince of Wales Stakes), two winners of the Poule d’Essai des Pouliches in Galgala and Cortiera, as well as a pair of Prix du Jockey Club winners in Good Luck and Sandgar. Goya did not have as much success in North America unfortunately, but did sire the stakes winners Arrogate, Artisimo and Goyamo. Caracalla was an undefeated champion by Tourbillon. Caracalla was the 1945 champion three year old in France and the champion older horse in both England and France the following year. This was before the advent of naming champions encompassing all of Europe. At three Caracalla won the Grand Prix de Paris, Prix Royal Oak, Prix Bay Middleton and in his first start the Prix Reiset. At four he captured the Prix de l’Arc de Triomphe, Ascot Gold Cup and two more stakes events for a perfect eight for eight racing career. Alas he was not be a successful sire, as he was an out and out stayer and his stud career would only serve to point out the unfortunate sire records of such stallions. Djebel became the son to lead a more pervasive influence for the Tourbillon male line through four of his own sons. Three of them are Clarion (Grand Criterium), High Lupus (Irish 2000 Guineas, Champion Stakes) and Le Lavandou (Prix Yacowlef). These three sired many top broodmares and one influential son each that would continue line. High Lupus sired Hethersett (Great Voltiguer Stakes, St. Leger Stakes) who later sired Blakeney (Epsom Derby). Blakeney became a consistent source of high class fillies and broodmares. Le Lavandou sired Le Levenstall (Sussex Stakes, Queen Elizabeth II Stakes) who would then sire Levmoss (Prix de l’Arc de Triomphe, Ascot Gold Cup etc). The most notable son of Djebel however is My Babu. Out of the Badruddin mare Perfume, who is a half sister to Ambiorix, My Babu was named the champion two year old in England in 1947, and then go on to win the classic 2000 Guineas and the Sussex Stakes as a three year old. Leslie Combs II purchased My Babu for stud duty at Spendthrift farm in Kentucky where the grandson of Tourbillon became very successful. He sired forty-seven stakes winners including four times leading Australian sire Better Boy, as well as the good stakes winner and sire Crozier. My Babu is the broodmare sire of Hall of Fame inductees Damascus and Gamely, as well as being the tail male grand sire of another member in Precisionist. Clarion is the sire of Klairon, winner of the Poule d’Essai des Poulins and the Prix Jacques le Marois. At stud Klairon sired Luthier (Prix Lupin) a four time leading sire in France, most notably the sire of Sagace (Prix de l’Arc de Triomphe) who in turn sired Arcangues (Breeder’s Cup Classic). Lorenzaccio (Champion Stakes etc) sired by Klarion had a very good sire career with Lorencino (Australian 2000 Guineas), Brewery Boy (Victoria Derby, SAJC Derby) and Ahonoora (William Hill Sprint Championship, Goodwood Stewards Cup and the King George Stakes). Retired in 1980 to the Irish National Stud, Ahonoora was then purchased by Coolmore in 1988 and utilised as a shuttle sire to Segenhoe Stud in Australia. Ahonoora was enjoying a very successful stud career until a paddock accident in Australia in 1989 ended his life. He sired Dr. Devious, winner of the 1989 Epsom Derby and the Irish Champion Stakes, and he also won the Dewhurst Stakes as a two year old. Other top winners sired by Ahoonara are Park Appeal (Chevely Park Stakes), Don’t Forget Me (2000 Guineas in 1984), Ruby Tiger (E. P. Taylor Stakes, Pretty Polly Stakes, Nassau Stakes twice, and Grosser Pries der Badischen Wirtschaft), Park Express (Irish Champion Stakes, Nassau Stakes, Lancashire Oaks), and Inchinor (Criterion Stakes, Greenham Stakes). Inchinor is also the sire of Notnowcato (Eclipse Stakes, International stakes, Tattersalls Gold Cup). Indian Ridge by Ahonoora was also a very successful sire until his unfortunate passing of a heart attack in 2006, age nineteen. Indian Ridge stood at the Irish National Stud after his racing career that saw him win the King’s Stand Stakes and the Duke of York Stakes. Among his many grade`group one winners were Domedriver (Breeder’s Cup Mile, Prix Daniel Wildenstein), Ridgewood Pearl (Breeder’s Cup Mile, Irish 1000 Guineas, Coronation Stakes), Relaxed Gesture (Canadian International), Compton Place (July Cup), Caumshinaun (Champion mare in Ireland), Namid (Prix de l’Abbaye, Greenland Stakes), Sleeping Indian (Dubai Duty Free Cup, Challenge Stakes), Pappa Reale (Premio Certosa), and St. Clair Ridge (Irish Futurity Stakes, Hillsborough Stakes). Ahonoora has been a successful sire of broodmares. Azeri by Jade Hunter – Zodiac Miss by Ahonoora won the Breeder’s Cup Distaff in 2002 as well as the Santa Margarita Handicap, Apple Blossom Handicap, Vanity Handicap, Milady Handicap, Clement Hirsh Handicap and the Lady’s Secret Stakes on her way to Eclipse Horse of the Year honours. She would add repeat scores in the Apple Blossom, Vanity, Milady and Clement Hirsh the following year to win Champion older female and then race as a six year old winning the Apple Blossom for a third time along with the Go For Wand Handicap, the Spinster Stakes and another Champion older female award. Ahonoora is also the broodmare sire of three current top sires in the world today. Cape Cross by Green Desert, is out of Park Appeal and is already a leading sire. Cape Cross is the sire of Sea The Stars (Epsom Derby, 2000 Guineas, Prix de l’Arc de Triomphe etc) and Ouija Board (Epsom Oaks, Breeder’s Cup Filly and Mare Turf twice, Hong Kong Vase, Prince of Wales Stakes etc), who is the dam of the outstanding 2014 Epsom Derby winner Australia. 2008 Epsom Derby winner New Approach by Galileo, is out of Park Express. The winner of the Dewhurst Stakes and the Champion Stakes as a two year old in England and Ireland, New Approach entered stud in 2009 and is off to a flying start siring in his first crop 2000 Guineas winner Dawn Approach, Libertarian (Dante Stakes) and Monsegur (VRC Breeder’s Stakes) as he shuttles between Great Britain and Australia. Leroidesanimaux was bred in Brazil from the mare Dissemble by Ahonoora. His sire is Candy Stripes. Leroidesanimaux won the Citation Handicap at four in the US and the Woodbine Mile in Canada at five. He is the sire of Animal Kingdom (Kentucky Derby, Dubai World Cup, and Breeder’s Cup Mile) and Una Cabeza, winner of the group one De Pontricas Stakes in Argentina. Leroidesanimaux has stood stud in Kentucky and Florida, but is now at Lanwades Stud, Newmarket beginning in 2014. Returning to Tourbillon, we see additional top class stakes winners in Gaspillage (Poule d’Essai des Poulins), Tornado (Prix Lupin, sire of Tyrone and Aquino II), Turmoil (Prix du Cadran, sire of Popof), Fort Napoleon (Prix d’Ispahan, leading sire in Brazil), Timor (Prix Hocquart, sire of Argentinian champion Pronto), Tourment (Poule d’Essai des Poulins, Prix Royal Oak, sire of Cerisoles)and Marcius (Goldfields Handicap, three time leading broodmare sire in South Africa). Tourbillon’s influence in world breeding was substantial, to say the least. 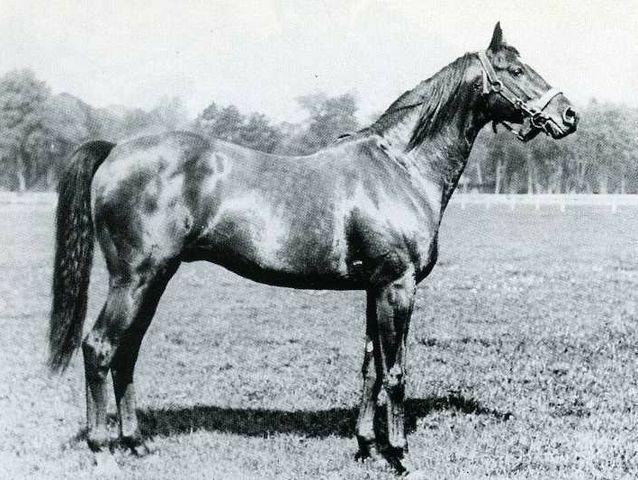 While there may be greater numbers of stakes winning descendants from other sires of his generation, one can not dispute the enormous contribution Tourbillon made in breeding. The top descendants of this great French bred stallion have won many of the most important races around the world, and while the line has faded over time, there still remains a strong thread of connection to Tourbillon. The legacy of Tourbillon is secure. His tail male line while not prominent is still very important. As the foundation sire of one of the great breeding establishments in turf history, he is unquestioned. Champions with Tourbillon in their ancestry have proven to be very reliable to continue his name in championship pedigrees. Tourbillon died of a stroke on July 26, 1954 at Haras de Fresnay le-Buffard. Marcel Boussac had him buried in a prominent place on the grounds. Read w/interest & learned! Fascinating to know more about Tourbillion!! Many thanks for the superb info, Colin! Wishing you a Wonderful & Healthy New Year! I always looki forward to your excellent profiles — hope you’ll “keep on”! Cheers! Wishing you a Wonderful & Healthy New Year! I always look forward to your excellent profiles — hope you’ll “keep on”! Cheers! I was checking to see if you had written about Lava Man yet, and I kept coming up with Tourbillon. I read it, but didn’t see anything about Lava Man. As always, your writing puts the reader right there, no matter if you are talking about one of these great horses racing, breeding, or some endearing or comical fact. I enjoy your writing so much. Boussac’s main man. His stuff did real good for a few generations everywhere. Consistent sire. Looks powerful. Thanks for the interesting info.